It doesn’t hit you right away. It’s not until well into the last 30 minutes, perhaps even after the credits roll, that you realize why Richard Linklater’s Boyhood is such an immaculate yet intimate achievement. As many of you undoubtedly know, the project began back in 2002, when Linklater went full steam ahead on a film that would track a boy and his family from age six to eighteen. With a cast assembled, the film was shot for a few days every year until 2013. The result is moving and deeply effective. I may not have yet reached the age where I can look back upon the entirety of the span of Mason (Ellar Coltrane)’s life depicted with any degree of sufficient hindsight, and I feel like I’ve stopped just short of being able to appreciate the totality of what most others who have seen the movie have found, but that doesn’t mean I am unable to see Boyhood as a magnificent piece of filmmaking; something simultaneously human, and extraordinary. Mason and his older sister Samantha (Lorelei Linklater, daughter of Richard) are raised in a small Texas town by their mother Olivia (Patricia Arquette). Olivia and Mason, Sr. (Ethan Hawke), the kids’ father, divorced some time ago, following which he lived in Alaska for a while. When Mason is in the first grade, his mother moves the family to Houston, so she can return to college and pursue plans that were derailed when she originally became pregnant with Samantha. This is around the time that Mason, Sr. comes back to Texas, in order to take a more active role in his children’s lives. In the ensuing twelve years, Mason and Samantha witness the introduction of Olivia’s two following marriages, one of which ends quite violently, and experience, in their own ways, and among other things, new friends, new schools, first relationships, and college, always against the backdrop of looking into the uncertain future of life. And it’s this kind of slice-of-life approach that forces us, as viewers, to forgo kinds of cinematic regularities that we would otherwise come to expect. Consider, if you will, a scene where Mason, in the eighth grade, spends the night with a few other of his similarly aged friends and two high school seniors in an almost-built house belonging to the family of one of them. Among the things that happen in that scene is a spare piece of plywood, with a human figure loosely drawn on it, having a circular saw blade repeatedly thrown into it as they chuck the saw blade, and see where on the “body” they can hit – somebody gets the pancreas, another the liver. In many movies, this scene would be written as a catalyst, the scene where somebody is grievously injured and Mason is traumatized. But nothing happens. And you realize how true to life it is: I’d venture the guess that most of us did stupid/dangerous things with our friends in middle school, and most of the time, nobody dies. It’s here when it becomes even clearer that Boyhood is purposefully attempting to obliterate the tropes of sort-of forced “event” sequences in coming-of-age films, instead trying to depict things as they might happen. The performances help drive this home. It’s quite amazing to watch Ellar Coltrane go from a first grade student to a college freshman in two and three-quarter hours, and I think for younger viewers of the film, we finally begin to understand older relatives at family gatherings never failing to tell us how big we’ve gotten. His performance becomes more complex as he ages, as well. Hawke, as Mason Sr., also undergoes a different kind of character maturation that is at once quite logical and surprising. And as Olivia, Patricia Arquette delivers a showing so understated and quietly powerful that a lot of people don’t understand why it’s so incredible. The character picks up a lot of changes and goes through a lot of tough stuff. In a scene towards the end, on the day that Mason, Jr. is about to go to college, and she will have no more children to raise and feels that many of the “milestone” events of her life have passed, breaks down at the kitchen table, and tells her son “I just thought there would be more.” But the movie doesn’t make it a climax. There’s no big speech in return from Mason, or a tear-soaked hug. It quietly cuts to another of the film’s most brilliant sequences (however, this one is dialogue-less), which I won’t ruin, but I will say uses the film’s trailer music, Family of the Year’s “Hero”, to great effect. 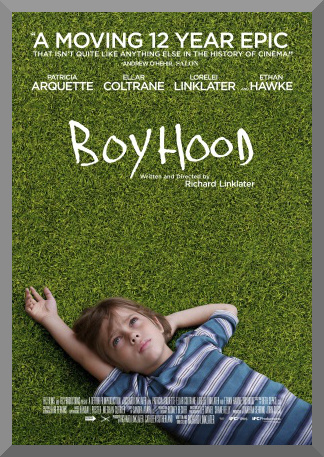 Boyhood ends just how it began nearly three hours prior: two people talking. A less restrained and more desperate filmmaker would want to cap off a sprawling family drama with some sort of grand, overblown conclusion, but Linklater has too much respect for his viewers to abandon the roots that he’s been continually showing to them. The content of the final scene, if I may share such information with you, features Mason, on his first day of college, near a vast canyon, conversing with a fellow student named Nicole (Jessi Mechler). Nicole says that she’s never agreed with the idea of “seizing the moment”, rather, the moment seizes us. Mason agrees. And to be totally honest, I didn’t think the movie needed this scene. Or the 5 – 10 minutes before it. But it is in this that Boyhood’s aesthetic is fully verbalized: it’s not as much about what happens or when it happens but how it happens. And that freaks a lot of people out. We live in a society where we want to be in control of everything, wanting to live a life in constant grasp, and seemingly unwilling to let things reach us instead. The same belief holds with the few, but existent, of Boyhood’s naysayers. Some people say this is a boring movie, thinking that nothing happens, which is, if I may say, purely the belief of those watching in the wrong mode, waiting to seize a moment that has already been attempting to seize them. This is very much a movie that has to have moments seize you. And when you let it, you find something wonderful.